Office Hours: Monday, Tuesday, Thursday & Friday: 8:30am-4:30pm. The office closes from 12:00-1:00pm for the lunch hour. The Village of Rushville is responsible for maintenance of the streets within the municipal limits, the public water supply, and the wastewater collection and treatment plant. Please see Village Streets and Water & Sewer for further information. The Board of Trustees is comprised of the Mayor and four (4) Trustees and is the elected governing body for the Village of Rushville. The Board is responsible for the overall functionality and general well-being of the Village. They prepare and adopt annually the fiscal year budget and tax levy. Ensures continuous good maintenance of the streets and other Village property, decides upon major capital infrastructure improvements for the Village and oversees compliance of State regulations for the public water supply and wastewater treatment. They also adopt local laws (when needed), address community and neighboring issues and work cooperatively with surrounding communities to accomplish projects. The Board tackles a variety of items and issues that face the Village and works diligently to resolve them. The Board of Trustees meets the first Monday of every Month (second Monday when the second is a federal holiday) at 7:00pm at the Village Hall, 1 South Main Street. All meetings are open to the public. If you would like to address the Board, please contact the Village Clerk to be placed on the agenda, by 12:00 noon the Friday before the meeting. The Rushville Village Planning Board consists of five (5) members who are Village residents, and are appointed by the Board of Trustees. The members serve on the Planning Board voluntarily, each for a two year term. They meet on an as needed basis at the Village Hall. Notices for all meetings are posted on this site, in the Village Office, and the bulletin board outside the Village Office. The Planning Board is responsible for a variety of duties including the review of special use permits, site plan approval, and zoning recommendations to the Board of Trustees. All members are required by NYS Law to attend 4 hours of creditable training on an annual basis. One member of the Planning Board acts as a crossover to the Zoning Board of Appeals so the two Boards may coordinate their efforts if necessary. The Zoning Board of Appeals consists of three (3) members who are Village residents, appointed by the Board of Trustees. The members of the ZBA serve voluntarily, each for a three year term. The ZBA meets on an as needed basis to decide mostly upon applications submitted to the Code Enforcement Officer, that are seeking approval for either an area variance and use variance. Notices for all meetings are posted on this site, in the Village Office, and the bulletin board outside the Village Office. All members are required by NYS Law to attend 4 hours of creditable training on an annual basis. One member of the ZBA acts as a crossover to the Planning Board so the two Boards may coordinate their efforts if necessary. The Reading Center Board consists of five (5) members of the greater Rushville community, who are appointed by the Board of Trustees. Each member serves a five year term, voluntarily. The Board meets on a quarterly basis or more frequently if needed. The overall purpose of the Reading Center Board is to ensure that the Reading Center is functioning properly and continues to benefit the Rushville community. Along with the Board of Trustees, the Reading Center Board oversees the Director of the Reading Center to ensure she is fulfilling her duties. Members: Heather Bassett, Nancy Elwell, Joanne LeClair, and Krystine Leo. Forms & Applications text here. If you are unsure whether or not your project requires a building permit, please call the Village Office to check before you begin! Building permits are issued for a period of six months. If the project is not finished upon the expiration date, the permit can be renewed for 50% of the original permit fee. A downloadable permit application and fee schedule can be found under Forms and Applications. The Village of Rushville employs two certified operators to pump, filter, and test the public water supply for the Village of Rushville, the Town of Middlesex, and the Marcus Whitman High School and Valley Elementary. The Village pumps and distribute approximately 32 million gallons of water annually and has over 300 water customers. The Village also maintains over 5 miles of tranmission line and several more miles of distibution lines within the Village limits. Every year the Village publishes an Annual Drinking Water Quality Report as in accordance with the standards set by the New York State Department of Health. Every customer receives a copy of this report annually with their quartly bill in April. Water meters are read quarterly by Village personnel and bills are generated and invoiced on the 1st of January, April, July and October of each year. Payment is due by the 15th of the month, in which it is billed. A 10% penalty is charged thereafter. The Village owns and maintains a bulk water facility, located on Warehouse Street near the intersection with Railroad Avenue. Water is availabe for purchase by any individual at a rate of $8.25/thousand, on location, using cash or coin. The Village of Rushvilles water operators are also licensed wastewater operators. The Village owns, operates and maintains a public wastewater system. The Village does have a unique system in which every residence and commercial building has its own collection tank where the solids are stored, but all gray water is directed to the Plant located on Warehouse Street, where it is treated and properly discharged. The Village own and maintain the tank at each property and is responsible for all repairs from the transmission line to the tank. The Village also checks each tank annually and ensures it is pumped when needed. The homeowner is then responsible for all maintenance and repairs from the tank to the home. All actions of the Village in regards the wastewater collection lines and treatment facility are under direction and regulations set forth by the New York State Department of Environmental Conservation. All connections to the Villages wastewater treatment system are billed on a quarterly basis, and are included on the same invoice as the water charges. The average home is charged for 1 sewer unit. The Village of Rushville owns and maintains 13 streets within Village limits. The most active roadways, Gilbert Street (State Route 245) and South/North Main Streets (State Route 247) are owned and maintained by the New York State Department of Transportation. The Village streets are comprised of: Bassett Street, Bryant Square, Castle Street, Chapel Street, Douglas Drive, Green Street, Hill Street, Railroad Avenue, Rubin Drive, Union Street, Warehouse Street, Warren Street, and Water Street. The Village is responsible for all maintenance on the above 13 streets, including paving and snow removal. In the summer of 2011, the Village launched the Sidewalks Project, with the goal of connecting the entire Village with a network of sidewalks. As budget allows, the Village plans to complete 1000 feet of sidewalks each summer. 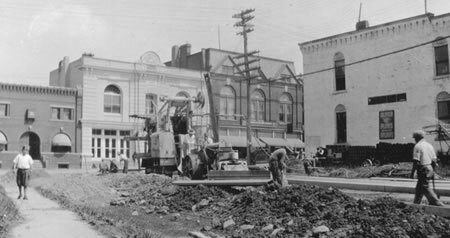 The first 1000 feet was completed along the east side of North and South Main Streets, allowing for a continuous stretch of sidewalk from Castle Street, through the business district, to the Reading Center, located at corner of Bassett Street and South Main Street. In the summer of 2012, another 1,000 feet of sidewalks were completed, connecting Castle Street apartments with North Main Street and then continuing from the previous year past the Reading Center on South Main Street. To continue the sidewalks efforts, in the fall of 2012, the Village applied for funding through the Safe Routes to School program and was awarded almost $300,000 to install sidewalks from intersection of Main Street and Gilbert Street to the Valley Primary School. This project was completed in 2014. The following year, the Village began construction of sidewalks on the north side of Gilbert Street and plans to complete the network of sidewalks from Main Street to Water Street, by the end of 2016.